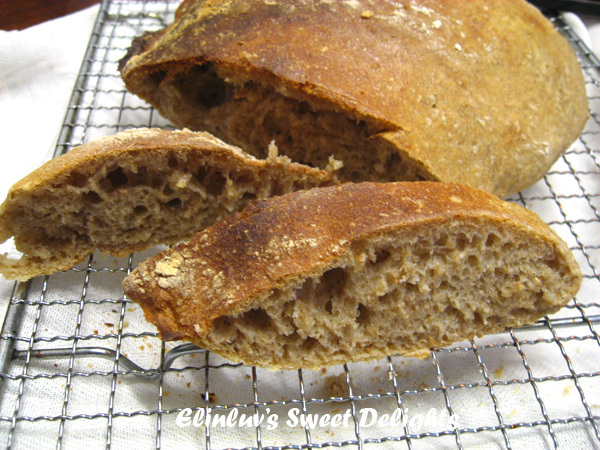 This healthy and delicious bread recipe is from my Healthy Bread in Five Minutes a Day by Jeff Hertzberg and Zoe Francois . I bought this book sometime back, but didn't have the chance to try out the recipe until now. During our bloggers meet up last last Friday , Lena asked me whether I have tried out the recipe and I told her I have not. This brings about the craving to try out the recipe out from the book. 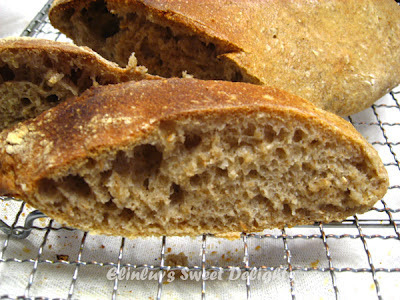 Lena , this is especially for you since you too have the book :) The bread turned out fantastically good. 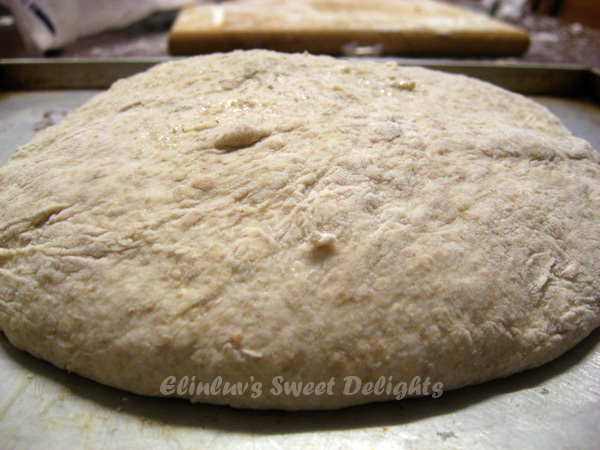 The trick is when you take out a portion of the wet dough, you have to use extra flour so that it is not sticky but tacky :) Handling the dough would be hard at first but after a while with some flour added, it was easier. The longer you let it ferment in the refrigerator , the flavor will be better if you wait for at least 24 hours of refrigeration. I leave it to ferment in a lidded container ( but not airtight ) for almost 2 days before using. This method suits me well, it saves me the washing and time saving in the preparation. 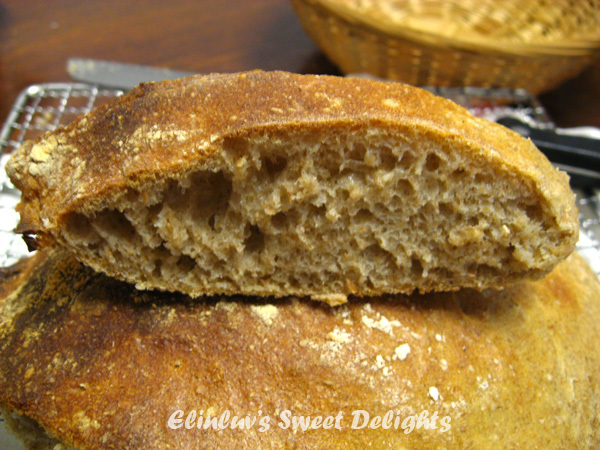 Each time I want a loaf of fresh bread, I just cut a piece of dough from the container , and just leave it to proof for 40 minutes, and tada in 30 minutes I get a fresh loaf of bread....easy isn't it LOL! Now, the five minutes mentioned here is not the whole process but the active preparation ! It meant that the mixing of the dough is just 5 minutes. The time taken to proof the dough before baking is the same as the normal bread making :p This dough after taking it out from the fridge , needed 40 minutes to proof before baking and 30 minutes for baking :) The only thing convenient is you dont have to start the preparation all over. And the longer you leave it in the fridge the better it will be. 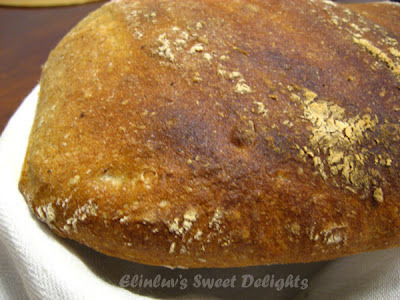 And the end result is a healthy and delicious Artisan bread that has a crunchy crust and moist and soft fluffy inside. When I see how well the fermentation is after two days in the fridge, I knew the bread will surely turned out great and true to it, the bread tasted so good even after a day...it remained soft except that the crust soften a bit. Just reheat in the oven for 8 minutes in heated oven would bring it back to its original crunch. The crust is a powerhouse of antioxidants. Antioxidants can prevent cancer and it is also rich in dietary fiber which can prevents colon cancer. Read here for more info on how good is bread crust for health :) So don't waste the crust :) For me, it is not so much for health but I enjoy the crunch from the crust and the fragrant of freshly baked artisan bread makes me happy...it somehow goes into my brain and it makes me HAPPY ! bread for dinner and breakfast....yumm! are still the best ! how much I love the crust...powerhouse of antioxidants ! this is good with a hot cuppa Coffee...yum! 1. Mixing and storing the dough : whisk together the flours, yeast, salt, caraway , and vital wheat gluten in a 5-quart bowl, or a lidded ( not airtight) food container. 2. Add the water and mix without kneading, using a spoon, a 14 cup food processor ( with dough attachment ), or a heavy-duty stand mixer ( with paddle ) You might need to use wet hands to get the last bit of flour to incorporate if you are not using a machine. 3. Cover ( not airtight) , and allow the dough to rest at room temperature until it rises and collapses ( or flattens on top), approximately 2 hours. 4. 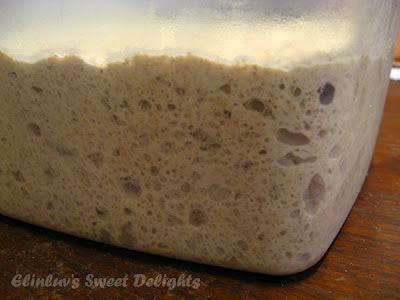 The dough can be used immediately after the initial rise, though it is easier to handle when cold. Refrigerate it in a lidded ( not airtight) container and use over the next 7 days. The flavor will be better if you wait for at least 24 hours of refrigeration. 5. 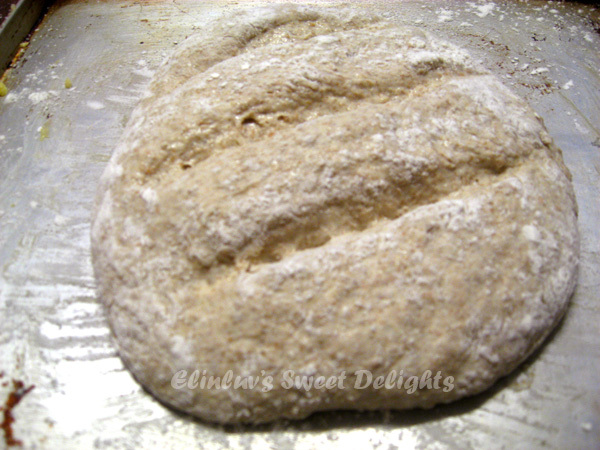 On baking day, dust the surface of the refrigerated dough with flour and cut off a 1-pound ( grapefruit size ) piece. Dust the piece with more flour and quickly shape it into a ball by stretching the surface of the dough around the bottom on all four sides, rotating the ball a quarter-turn as you go. 6. Elongate the ball into a narrow oval. Allow the loaf to rest, loosely covered with plastic wrap, on a pizza peel prepared with cornmeal or lined with parchment paper for 90 minutes ( 40 minutes if you are using fresh, unrefrigerated dough ) alternatively, you can rest the loaf on a silicone mat or a greased cookie sheet without using a pizza peel. 7. Thirty minutes before baking time, preheat the oven to 450 F or 230C , with a baking stone placed on the middle rack. Place an empty metal broiler tray on any other rack that won't interfere with the rising bread. 8. Just before baking, use a pastry brush to paint the top with water, and then sprinkle with the additional caraway seeds. Slash the loaf with 1/4 inch deep parallel cuts, using a serrated bread knife. 9. Slide the loaf directly onto the hot stone ( or place the silicone mat or cookie sheet on the stone if you used one ) Pour 1 cup of hot tap water into the broiler tray, and quickly close the oven door. Bake for about 30 - 35 minutes, until richly browned and firm. If you used parchment paper, a silicone mat or a cookie sheet under the loaf, carefully remove it two-thirds of the way through baking and bake the loaf directly on the stone or an oven rack. Smaller or larger loaves will require adjustments in resting and baking time. 10. 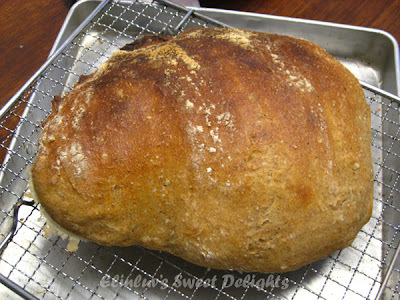 Allow the bread to cool on a rack before slicing and eating. Your bread looks wonderful! I have this book and so far have tried only one recipe and have made it twice, I love it. Will be making the same bread again (Betsy's Seeded Oat Bread), and this time I'll make sure to take some photos and post about it! I will have to try this Rye Bread too! Looks good! Your explanation is easy and simple to understand - makes it sound to make. Do you know where I buy the vital gluten in pj? Which shop stocks it?